HEJSupport International, IPEN and Canadian Environmental Law Association discuss the ways of making circular economy safe in a new publication “Circular economy framework promotes recycling but fails to prevent contaminants in new products: banned toxic chemicals detected in children’s toys” by Olga Speranskaya, HEJSupport International Co-Director, IPEN CoChair; Fe de Leon, Researcher and Paralegal, Canadian Environmental Law Association/IPEN participating organization. Circular economy is explicitly linked to the sound management of waste that aims to eliminate waste throughout the lifecycles of products and packaging to minimize the use of raw materials and energy. Recycling and recovery of waste, maximizing the useful life of materials and other resources, improving the design of materials and products, and minimizing waste generated at the end-of-life of products and packaging are the key components of a circular economy. Though countries invest a lot into achieving progress towards a circular economy, little or no attention is paid on toxic chemicals that appear in new products made out of recycled materials. However there is a growing body of evidence of how a circular economy fails to address concerns regarding toxic chemicals in products, particularly those intended for children. For example a new study, conducted in 2017 reveals elevated concentrations of toxic persistent organic pollutants (POPs) that have been detected in samples of plastic toys purchased in different stores in Canada and other 25 countries globally. Levels of some chemicals were more than five times higher than recommended international limits. These chemicals include PBDEs (polybrominated diphenyl ethers) such as octabromodiphenyl ether (OctaBDE), decabromodiphenyl ether (DecaBDE); and SCCPs (short chain chlorinated paraffins). They are listed under the Stockholm Convention on Persistent Organic Pollutants and are internationally banned or restricted due to their hazardous characteristics. They all are persistent, highly toxic, travel long distances and build up in the food chain. However, their presence in new products, although they are banned or restricted, opens up the discussion of a problem regarding recycling as a key component of a circular economy. Toys are made out of different types of thermoplastic, including polyethylene, polypropylene, acrylonitrile butadiene styrene (ABS), polyvinyl chloride (PVC). All of these types of plastic contain different chemicals additives which change or improve characteristics of plastic. PVC is one of the cheapest plastics on the market and is known to contain many additives used as thermal stabilizers to enhance the heat stability or as plasticizers to confer flexibility. SCCPs, an industrial chemical that has been used in plastic products as a softener and flame retardant, is one of the additives found in the analyzed samples of toys. The level of SCCPs detected in a significant proportion of the tested products in the study is 6 and 10 times higher than hazardous waste limits recommended by the Stockholm Convention for most POPs listed in the treaty. Thus, for example, 75% of products from Canada analyzed in the study would be considered hazardous waste. OctaBDE and DecaBDE are not known to be added directly to toys but they have been measured in toys samples at levels below those needed for flame retardancy. For example, OctaBDE in toys samples from Canada was detected at levels ranging between 9-280 mg/kg, while the levels of DecaBDE were between 20-297 mg/kg. A Stockholm Convention secretariat review of PBDEs presence in articles in use noted that the low levels of PBDEs in articles, including toys indicate that their presence is not the result of intentional use. They most probably appear in new products made out of recycled plastic that contained PBDEs (See Table 1) ((UNEP/POPS/COP.8/INF/12)). Recycling plastic may originate from, for example, waste of electrical and electronic equipment (WEEE) which is initially made out of different types of plastics including polyethylene, polypropylene, ABS, and PVC. According to the Stockholm Convention, hazardous waste limits define the value at which wastes are considered to be POPs wastes and therefore must be “Disposed of in such a way that the persistent organic pollutant content is destroyed or irreversibly transformed” (Stockholm Convention Article 6.1 d ii.). However, most plastics are recycled mechanically which means that processed recycled material containing hazardous chemicals may end up in the manufacture of final plastic products. During mechanical recycling the plastic is washed and cut into small pieces which are then used as raw materials for new products. According to COWI consulting company and the Danish Technological Institute, mechanical recycling rates for PVC materials may be up to 97.5%. Recycling of polypropylene materials can be in the range of 90 % or better while recycling rate of polyethylene products is in the range of 92-93%. During recycling new products contain the same additives as the original product. This is what is happening when WEEE is recycled into other products including toys which are made of the same type of plastic as parts of electrical and electronic equipment. Recycle of toys containing hazardous chemicals, including SCCPs and PBDEs also result in the appearance of toxic additives in other new products. Most hazardous substances used as additives are able to migrate as they are not chemically bound in plastics. PBDEs and SCCPs are substances well-known to migrate to the surface of the plastic product. At the surface the chemical substances evaporate or stay on the surface and come into contact with people’s skin. If children play with such products, hazardous substances migrate into their bodies due to normal hands-to-mouth behavior. Such unwanted migration may result in serious and sometimes irreversible health consequences. PBDEs can harm the reproductive system and disrupt hormone systems, adversely impacting intelligence, attention, learning and memory for children in particular. SCCPs adversely affect the kidney, liver, and thyroid; disrupt endocrine function; and are anticipated to be human carcinogens. Though SCCPs and four PBDEs are now regulated by the Stockholm Convention on persistent organic pollutants, recycling exemptions granted to products containing two PBDEs (penta and octaBDEs) opens the door for recycling of contaminated products at the end of life. Usually two or more PBDEs can be found in one product which is subject for recycling. Though an exemption to recycle waste containing decaBDE was not granted by the Stockholm Convention, it is difficult to identify and analyze products containing this flame retardant, it is not clear who would be responsible for analyzing for these chemicals either. As a result all PBDEs and SCCPs originally used in plastic appear in new products made out of recycled plastic, including toys despite the relevant restrictions of the Stockholm Convention. At the recent Conference of Parties to the Stockholm Convention, a small group of countries rejected proposals to at least label new products containing decaBDE which could have helped avoid recycling of such products. As a result consumers will have no information about their content in products they purchase, while governments will not know whether they are in compliance with the Stockholm Convention’s requirement that does not allow recycling of products containing Deca-BDE. Product recycling is a key element of a circular economy. 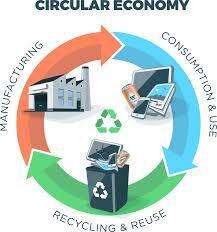 It encourages industry to return waste to the economy and reduce demand for primary raw materials. However material flows should be free from hazardous chemicals, at the minimum those chemicals which have already been regulated under the international treaties. An increased focus on toxic chemicals is a necessary element of circular economy. While governments promote circular economy and encourage industry to commit to the environment and resource saving approach through the use of recycled materials, toxic contamination with already banned and restricted chemicals continue as they leach or evaporate from the new products. New recycled produced products contain same toxic additives as the original material, forming a dirty circle. Thus while moving towards a circular economy, governments and the private sector should assure hazard reduction and promote the design of safer, non-toxic products from the start. This has valuable links to pollution prevention, precautionary measures, extended producer responsibility, and provides a clear, proactive role for the private sector to reduce and eliminate the use or generation of hazardous substances in the design, manufacture and application of chemical products. The green chemistry principle of designing chemical products to be less hazardous to human health and the environment should become a core approach towards circular economy to ensure safer alternative products and processes, including non-chemical alternatives, cleaner production and informed substitution of chemicals of concern. This green chemistry principle is reflected in the Dubai Declaration of SAICM (The Strategic Approach to International Chemicals Management), which highlights the importance to develop “safer alternative products and processes, including non-chemical alternatives.” In addition SAICM’s Overarching Policy Strategy includes the need to promote “cleaner production, informed substitution of chemicals of concern and non-chemical alternatives” and undertake research to develop, “safer chemicals and cleaner technologies and non-chemical alternatives and technologies.” To meet the requirements of the international agreements such as SAICM and the Stockholm Convention, governments should promote innovation in product design and chemical use that will benefit recycling practices and avoid use of recycled materials that contain hazardous substances. However even those countries which support a shift towards a circular economy, still fail to address concerns regarding toxic chemicals in products made out of recycled materials. For example, the Strategy for a Waste Free Ontario adopted in 2016 considers end-of-life materials as resources to produce goods that can also be recycled. Through regulations, the government will “establish outcome-based requirements that producers will have to meet, such as reduction, reuse and recycling targets”. Though the Strategy includes the aim to decrease hazardous and toxic substances in products and packaging, it does not highlight the need for informed substitution of chemicals of concern to ensure safe product reuse and recycling in the end of life and avoid contamination of new products with toxic chemicals. According to Article 6 of the Stockholm Convention, once Persistent Organic Pollutants become wastes, Parties to the Stockholm Convention are required to dispose of waste so that the POPs content is destroyed or irreversibly transformed. It does “not permit the recycling, recovery, reclamation, direct reuse or alternative use of the POPs”. However special exemption was granted to Canada and the EU that permits recycling of materials such as foam and plastics that contain Penta and OctaBDEs until 2030. This exemption violates Article A of the Stockholm Convention and opens the doors to dirty recycling which undermines circular economy and credibility of recycling. POPRC recommendations, opposition of the non-governmental organisations and developing country Parties brought some good results when permission to recycle articles containing Deca-BDEs was not granted. However as noted above, there is still a possibility to recycle waste containing POPs into new products. The circular economy must be a clean circle, and not a dirty one. Dirty recycling undermines countries’ efforts to develop a safe circular economy, achieve clean environment and improve the health of people.